A man wearing (only?) a Pittsburgh Pirates hat and gray sweatpants attempted to break into the Steelers locker room at Heinz Field Saturday with a hammer. Security at the stadium noted that he busted a lock at Gate B to gain entry to the stadium and then took his own personal tour of the playing field before heading to the locker room. With guards watching the security feed, Mr. Winters tried using a hammer to get inside the locker room, according to the complaint. 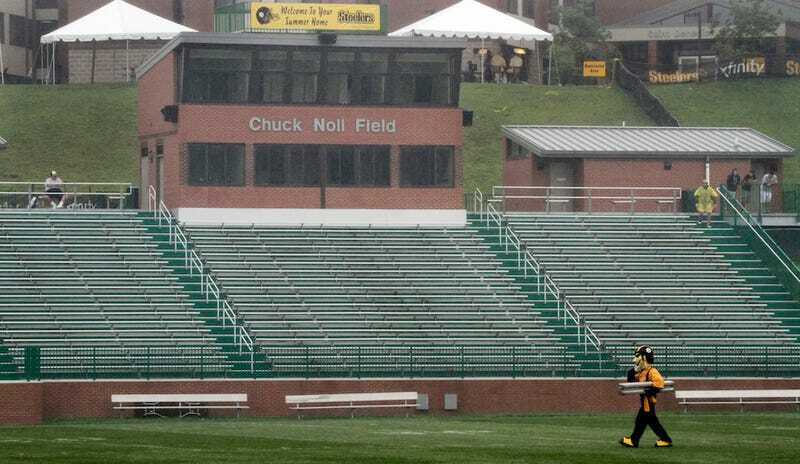 When two Pittsburgh police officers arrived with stadium security staff, they found marks on two doors as well as damage to a bolt holding the knob on the locker room door, according to the complaint. The man, identified as 28-year-old John Winters, has a history of middling criminal activity. Most recently he pleaded guilty to "simple assault, retail theft and receiving stolen property." He was also accused of defiant trespass in connection with those charges, but it was dropped as part of a plea-bargain.